There may be days when you feel like you know nothing at all and there will be days when clarity is abundant. Our Spiritual journey is but a vast contrast of either the most deserted desert or a rain forest filled with everything alive and beautiful. The variance of our Ego contradicts what our Soul craves, these two energies are conflicting, polar opposites and the merit in each is to understand their difference. Life is full of evaluations, from a young age we learn how to negotiate as we mature the practicality bars are raised and the importance, worth or usefulness of something or someone becomes keener. From one stage of life to the other our responsibility towards decisions tightens and stress becomes a factor we would rather forget or ignore. Mistakes are made and frustration overwhelms, daily routines, duty, task, and function become burdensome and what is left at the end of the day is confusion, ‘am I really meant to feel so unhappy’, you find yourself asking more often than not? When we are completely indulged in our Ego mind everything becomes a problem and nothing is made simple. Our Ego creates drama to cause us stress which reduces our internal energies the result being we feel drained, exhausted and happiness fades into the sultry background. Unbeknown to us we have been carrying around a system within us which has the ability to provide all the answers we need to any query we have ever pondered. Actually right now at this moment, you have the answer to your biggest question, the debate and uncertainty you have in your life at present you can resolve it! You have all the answers you will ever need if you would only begin to trust your intuition. Your intuitive nature is a very natural part of who you are heck you were born with it, it came with you as part of your package no-one is exempt from this gift. There is an advantage as we grow more spiritually mature our intuition grows along with it as well, therefore our challenges become easier to manage and understand. Is it time for you to trust those butterfly moments you have inside when you are faced with a situation, has the time come for you to be more aware of what your Soul provides when you need it most? 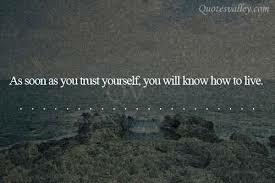 You have all of the answers to everything you need to know, trust your Self and life will become less complicated.